Your website is the foundation for everything you do online. It’s your 24/7 sales person that presents an image of your business to everyone who finds it. A site that says, “Welcome!” and helps visitors get where they want to go is poised for success in Google’s local search results. On the other hand, cluttered navigation, unattractive design, and missing information is a sure way to bounce people right off your site. In this section, we’re going to show you how to structure your site in a way that makes it easy to use, converts visitors into customers, and lays the groundwork for success in local SEO and Google Places for Business. If you’d like a quote on improving your website’s design, please contact me. One of the most important things to do is to make sure your business name, address, and local phone number appear in HTML on your website and that it is the EXACT same NAP (name, address, phone #) which is listed on all of your internet business directory listings. This is very important. The more often Google sees your business information listed consistently online, the more it trusts that the information is accurate and it ranks your site higher in local search (Google Maps). This is the 3rd most important point stressed by industry experts for ranking your business well. To best succeed in Google local search results, it’s also recommended to include your city/state in the title tag of most pages on your site. Thus, if you’re located in Portland, Oregon, try to include “Portland, OR” on as many pages as possible on your website. Definitely include it on all of your service/product pages, as well as your home page. Whether you’re designing a new site or re-structuring an existing one, start by laying out or reviewing your sitemap. A sitemap is an organizational outline of your website’s structure, starting with your home page and flowing out to all other pages on your site. If you’re running WordPress like I am, you can install the free plug-in WP Sitemap Page which produces an HTML sitemap on any page you want. Categorize and group your site’s content in a way that makes sense to you and it’ll probably make sense to users and Google, too. A model similar to the one above will work well for most local businesses like mine who offer products and/or services for sale. Each heading listed above is a folder and is used to organize my site in a way that makes sense to users and Googlebot. Notice how each folder is simple and easy to understand. I’m all set to add pages to my site and categorize them under the appropriate folder. When I add navigation to my site, all I have to do is add a button or link for each of the folders listed above to ensure that visitors and Googlebot can get to every single page on my site. I put my most important navigation at the top of my site (home, about, services, contact) and the others in my footer navigation (resources, guide, case studies, blog, sitemap). I recommend installing HeatMap software like CrazyEgg to see exactly what visitors are clicking on. That’ll give you hard data with which to organize your site’s navigation based on the things people click on most. I’ve got plenty of room within this structure to add additional resources, services, guide pages, case studies and blog posts as I need them. I plan to leave breadcrumbs across the top of every page, so users always know where they are. Having a sitemap on your website is helpful for both users and search engine crawlers. It’s an excellent organizational tool that will help you target your keywords as you begin to build out or improve your website. Have questions about organizing your site’s structure? Call me at 503-890-6663. I’ll help you nail your sitemap for best results in Google. What is the most important thing you want people to do when they come to your website? Are you trying to generate phone calls? Are you trying to build an email list? Do you want people to order a product or sign up for something? Whatever it is, make it easy for them to do it. Put it front and center and use multiple calls to action in different places of your home page, so it’s clear to a new visitor what action you want them to take. Use color to make those calls to action stand out. 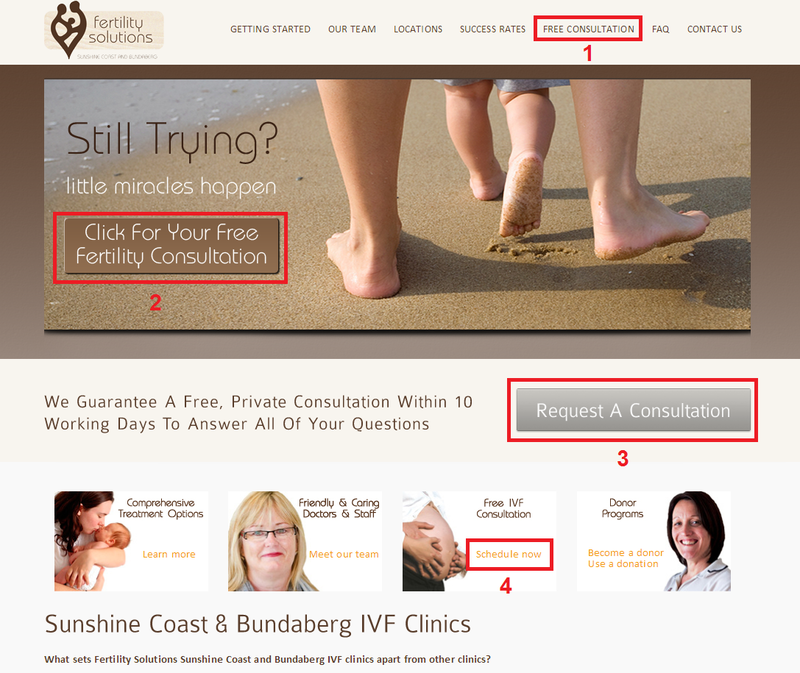 The #1 goal of Fertility Solutions’s website is to get new patients through a free consultation. There are 4 calls to action on their home page above the fold to make it easy for visitors to schedule a consultation. Visit site at http://fssc.com.au/. Here’s another good looking home page from TakeLessons.com. Look how easy they make it to begin your search for a teacher. The search option is right in the middle of the page and the blue “Search For Your Teacher” stands out, showing you that you’re one click away from finding your perfect music instructor. Consider the most important mission of your site and then put it in multiple places on your home page. After all, your home page is probably going to be the one that’s viewed the most. One final note on your home page. For a local business it is of utmost importance that you put your business name, address, and phone number in HTML somewhere on your home page. Skip to the lesson that explains why. I consider core pages to be the ones you’d most like to rank for in Google. In my case, it’d be nice to rank for each of the services I provide because if my site gets found for them in organic search results, I’ve got a good chance of generating a new lead. For most small business owners, your core pages are going to be your product/service pages because they’re the ones that could lead directly to new business. Your blog is also an excellent source of leads and we’ll get to that next. As I put together my sitemap for mikemunter.com, there are 4 main services I provide – WordPress web design, local SEO/Google Places, Changing Google autocomplete, and reputation management consulting. So, I created a page for each of those services in my /services folder. What are the benefits of this [service/product]? Be descriptive as you write and be sure to include links to any case studies where you’ve provided this product or service. Explain how you’re different than your competitors. Include images and video if necessary and aim for a completed page with length and quality, as longer pages tend to do better in Google. When your service or product pages are complete, optimize them using these on-page best practices. Make sure you have a call to action with your phone number and/or link to your contact page. As the business expert, make sure your pages are representative of your beliefs and personal style. Make them pages you are proud of because you’ll be promoting them again and again as you continue to market yourself online. Blogging is one of the best ways to generate inbound leads. Every business owner I know who blogs on a regular basis (myself included) enjoys a steady stream of traffic that gradually rises month after month. The minute we stop blogging, traffic levels off and often decreases. Evergreen Content. Your blog ought to contain content that’s got a shelf life. Don’t blog that your office is closed for the holidays or that you’re hiring a new employee. Put those things in your newsletter or Facebook page. Anything that goes on your blog should be useful and relevant for at least 6-12 months or longer. Answer Frequently Asked Questions. Make a list of the questions customers have asked you in the last few days. Have your staff do the same. Keep this list in a central place, maybe on a whiteboard in your conference room. Perhaps employees could use post-it notes and stick them up in the break room. Each month, review the questions and publish answers to the best ones as blog posts. If one person is asking it, others are asking it, too, and they might be searching for it online. Report On Industry News. What new trends are coming along in your industry? What news story just broke that has an impact on your business and your customers? Explain what it’s all about in a blog post and give your opinion of the situation. Do Research. While you might sort this content under a Resources section of your website, you might also categorize it as a blog post. Well-researched pages that gather and present data in a consumable way give you content you can hang your hat on and they are also an attractive way to gain links. You can take it a step further by asking for opinions from industry experts and publishing those opinions on your site. Often referred to as “ego-bait,” pages like these are apt to be shared on social media and attract attention. Be The Authority. The main thing you want to do with your blog is make each post authoritative. Educate potential visitors with your knowledge of the subject matter and you’ll establishing trust that will lead to new customers. Whenever you blog, look for opportunities within your content to link back to one of your core service/product pages or to another blog post. This simple strategy of “internal linking” helps distribute PageRank throughout your site and is an excellent way to take visitors deeper into your site for longer periods of time. Many SEOs believe “time on site” is an important metric Google considers when ranking websites.